Page number is for applying a sequence of numbers of the pages of a book. The user can check the page position and look up where they read. How you put the page number? Here are some tips. 1, In common, when you open a book, the odd numbers are on the recto pages. The even numbers are on the verso pages. But some designers edit page numbers oppositely. In the beginning of the book, it also has some blind folios. 2, Please don’t design the page numbers are too closed to the cutting line. Keep at least 5mm space from the page numbers to the cutting lines. 3, You may design the page numbers in the middle of the book bottom or the cutting edge. Don’t design the page numbers are in the binding edge. Because it is not easy to read and check. 4, For blank pages, you don’t need to add page number. They are blind folios. 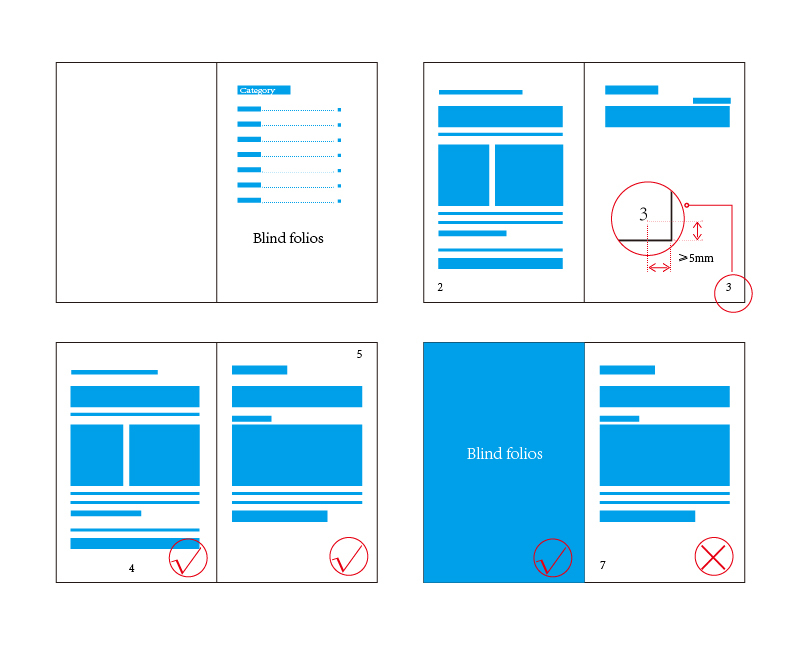 The category pages also can be blind folios. 5, More books page numbers are on the page bottom. Some books with page headline on the page top, the page numbers also can be on the page top. But it also is not on the spine edge. 6, All page numbers are same font, same size and same position is better.